Am I the only one who thinks boys are difficult to shop for? Anytime I ask Omar what he wants for Christmas his response is either "I don't know" or "Eagles stuff." He's so simple, yet so complex. Also, Omar if you're reading this I did not get you anything on this list, but nice try ;). 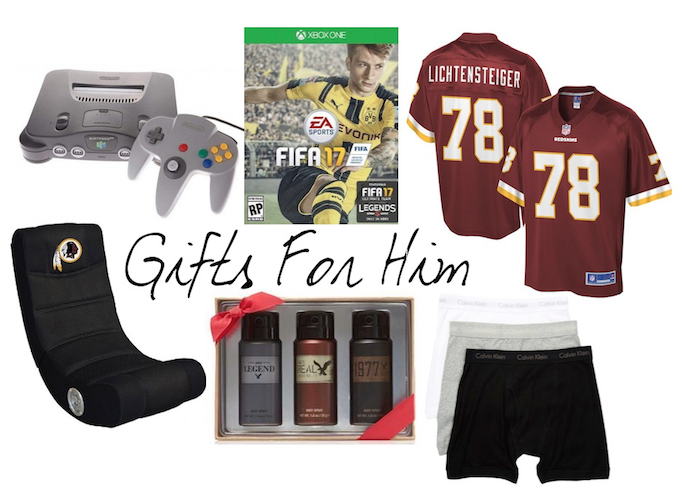 If you struggle like I usually do to get a nice gift for the man in your life, here are some ideas! One. Cologne // You can never go wrong with a nice cologne. It's important to know their scent and what they like or dislike. You can never go wrong with an American Eagle gift set or a badass Batman cologne. Two. Sport Jerseys // Omar and I have this tradition that I get him an Eagles jersey and he gets me a Redskins jersey. Except everytime I buy him an Eagles jersey they end up leaving the team... sorry, not sorry babe. If your boo has a favorite sport team you can get fairly priced jerseys on Amazon just any sport, any team, and any player. Three. Undies // I think this is a great gift for a boyfriend/husband. Guys don't really spend money on their undergarments like girls do, so it's a nice way to spoil them. How cute are the Calvin Klein ones? Four. Button Up Shirts // Again, clothes aren't something that guys will typically spend money on. I know if Omar had his way he would buy the $5 button up shirt from H&M without even trying it on. Take the time to spend the money on a good quality shirt that will last them a long time. Five. Video Games & Consoles // Does your boyfriend play video games? Omar loves Madden and any game that involves shooting- typical. I got him a Nitendo 64 last year for Christmas and he absolutely loves it. If you know there's a game they've been wanting (like say, FIFA 17) then grab it for them. Or even a gift card to GameStop because that's the one store that Omar loves to spend time in when we go to the mall. If you really want to go above and beyond they make custom made controllers and gamer chairs! Well those are some of my ideas. You can always get them clothes, candy, and workout clothes too. What are some of your ideas?